At our latest gig a photographer gave me this pick to test. He and his brother has this small company where they produce and sell picks. I’m not kidding you, it’s a great pick and I immediately ordered more. I have no affiliations with this company, but I wanted to share when I saw this thread was brought back. They do write in the text that their picks are made for rock, heavy and shredding, but I promise that they are great for country and blues as well. Reviving an old thread as I’ve been thinking a lot about pics lately. Sorry I’m advance for the long post. Haha. For a couple years now I have been using the Dunlop Tortex .60 orange picks. For me they always worked great for electric rock style, especially for single note stuff, riffs, etc. now that I’m doing more of the acoustic strumming I’m having increasingly hard times holding the pick and not losing it in my band. 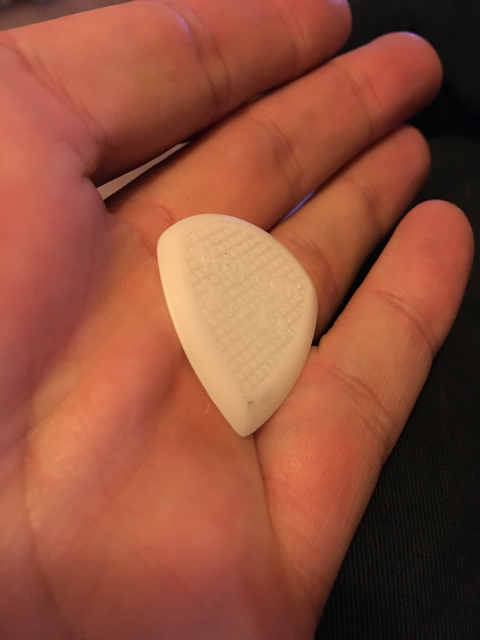 What I’ve discovered is that all this time I’ve been holding the pick completely wrong in my hand. If you go watch any of my YouTube videos you will notice that my right-hand angle looks a little funny. Almost bent. I’ve been working really hard on holding it the right way but it just doesn’t feel right when it hits the strings with those heavier picks. Like a dead sound without any “feel” or “touch”, of that makes sense. Well today, further experimenting - I went back to trying the same with my original set of super thin picks that Justin recommends for beginners. I think they are Dunlop tortex ..38 (white). I couldn’t believe how easy it was with the new holding style. So maybe that’s the key - just getting used to it with the lighter picks. Does this sound familiar to any of you?